In 1958 the Warren Chamber of Commerce was incorporated. At that time the towns of Barrington and Bristol each had their own Chamber of Commerce. In 1972 our Chamber was organized and incorporated when the Bristol, Warren and Barrington Chambers merged to become the Bristol County Chamber of Commerce. 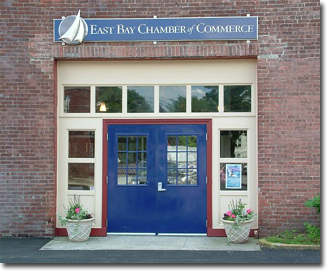 In 1998 the name of Bristol County Chamber of Commerce was changed to the East Bay Chamber of Commerce to reflect our wider vision. Emerging from three small retail groups, our Chamber has grown in size and programming to meet the needs of our business community and to be proactive in the concerns of our businesses as well as the communities we serve. Growth and change in the East Bay have occurred and will continue to occur. Planning this growth is essential. The quality of life in the East Bay is our strongest asset and must be preserved. There is still much to accomplish here at home. To preserve the best that we have, to improve that which needs improvement, and to promote a strong economy must be the goals of those in East Bay leadership positions. Our heritage and culture is extraordinary, our potential is promising and our future holds many challenges that must be met in a proactive and intelligent way. The East Bay Chamber of Commerce is a not-for-profit organization, and not part of local or state government. The Chamber is financed primarily by membership dues, and is supplemented by various grants and fundraiser. These fundraisers, in addition to raising funds for the organization, are also extremely enjoyable networking opportunities. The East Bay Chamber of Commerce's 300+ members continually invest in the county's future. These business leaders have pledged their time and talents to improving the business climate, fostering economic development and promoting our splendid resources. Sign up for our Tuesdays at Two emails for more East Bay Chamber news and events.